The OpenBase Connectivity Module package contains several examples, release notes and a folder called "OpenBase" which contains the entire encrypted source code for the module. To install the module by dragging the OpenBase folder into your project. The next step is to identify what picture class you need to use in the module. We supply two because the regular picture class does not work for console applications. The picture classes are in folders inside the OpenBase folder. If you are creating a Console Application or RB Stored Procedure then add the "For_Console_Applications". Any other applications that have a GUI should use the "For_GUI_Applications". While this sample uses RB 2005r4 it is very similar for all supported versions of REALbasic. 1. Make sure that you can log in to the pubs database supplied with OpenBase using openisql_ascii. You will need to know a userid, password, database and host. If this is a new installation then the userid is likely still "admin", no password, and the host should be "127.0.0.1". MacBookPro:~ npalardy$ /Library/OpenBase/bin/openisql_ascii -use pubs@127.0.0.1 -login admin -password ""
Copyright (c) 1993-2009 OpenBase International. Ltd. This confirms that you can actually use this database, it is running and you are able to log in. If you can not log in then this should be corrected before trying to proceed. 2. Start a new REALbasic project. When asked select the "Desktop Application" template. 3. Drag in the "OpenBase" folder from inside the "Connectivity Module" folder. You will notice that this adds a new folder inside your project. When you expand this folder you should see two other folders inside. One is "For_Console_Applications" and the other is "For_GUI_Applications". Notice that the second folder is bold indicating that it contains some items. REALbasic has imported all the items and created appropriate folders based on what you dragged in. When you do this REALbasic imports the first OBPicture contained in the "For_Console_Applications" folder. When the "For_GUI_Applications" folder is imported the second OBPicture replaces the first one so you are left with an empty folder and the proper OBPicture for use in a GUI application. msgbox "cannot connect to 'pubs'"
8. Run the project. You should get a message that says you have connected. If you cannot connect make sure the user name, password, host and database are for the database you logged into in step 1. Congratulations! You’ve just started using REALbasic and OpenBase. This example is the BasicConnect.rbp example in the OpenBase RB Examples. The BasicConnectToPort.rbp example shows another technique to use with RB when a database has been set up to run on a specific port. This is useful when you want to ALWAYS have a certain database one a certain port, perhaps behind a firewall with a port forward. You can make OpenBase always run a specified database on a specific port. The only change to the program is the setting for the databaseName. The OpenBaseInfoConnection is NOT used for querying the database. The OpenBaseInfoConnection can be used to get information about the OpenBase server. If you need to get information about the server you are connected to you can get that using the OpenBaseInfo class and connecting to the desired host. 1. Start a new REALbasic project. When asked select the "Desktop Application" template. 2. 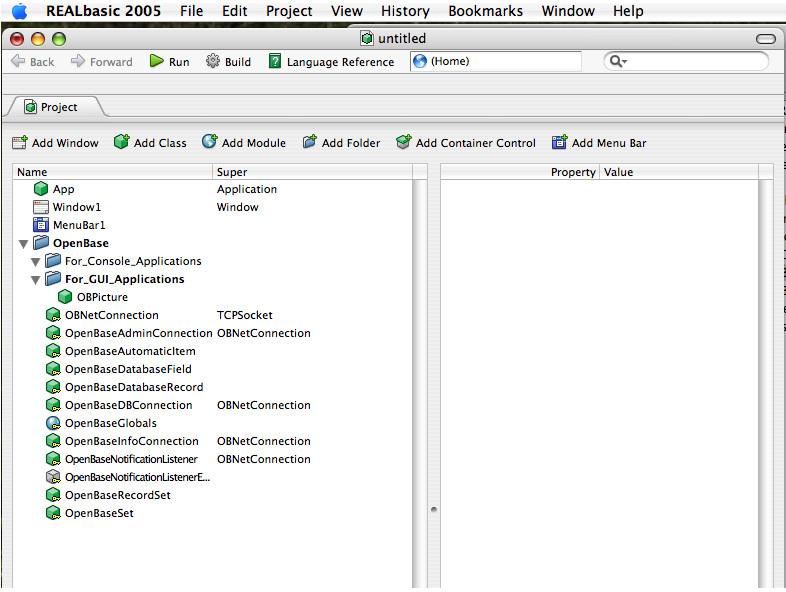 Drag in the "OpenBase" folder from inside the "Connectivity Module" folder as in the previous example. 3. Add a push button and an editfield to the default Window1 that is in the new project. 6. Run the project. The editfield should show you the complete information about the database server. Note that this is a number of fields of information all in one long string. Each value is separated by a | symbol. The OpenBaseAdminConnection is also NOT used for querying the database. The OpenBaseAdminConnection can be used to start databases, stop databases, create databases and numerous other administrative tasks. If you need to get information about the host you are connected to you can get that using the OpenBaseAdmin class and connecting to the desired host. In your applications you can use the module in the same manner you would have used the Database, DatabaseRecord, DatabaseField and RecordSet classes. There are some differences noted below. The Language Reference documentation on methods and properties applies to the new classes as it did to the classes available from the various database plugins. There are some differences in the usage though. Becuase the OpenBase Connectivity Module has been designed to be used in Console and GUI applications, the use of Pictures varies between these two style of applications. As well, in order to make using the Module in a Console application possible, a new class, OBPicture, is used instead of Picture. Console applications that try to use Picture will not compile. So, there is an implementation of OBPicture for Console applications, and a different one for GUI applications. You should ALWAYS call close on a OpenBaseDBConnection when you are done with it as they DO NOT close when they go out of scope. This is different than most other database plugins. This has to do with the fact they are socket subclasses. In general client side timeout are disabled by default. However, you may want to set the timeout ON for things like Connect, and then disable it once you are connected. This way you can avoid the situation where you wait indefinitely for a connection. If you examine the example window "testnotifications" in the GUI_and_admin app it will help as this sets everything required. A notifcation listener MUST be "added" to a regular database connection. It cannot exist on its own. A notification listener is just a class that impleemnts the interface "OpenBaseNotificationListenerEvents"
Tablename will contain the name of the table that the action applied to. Rowid is the rowid of the record that that the action was aplied to. In order to listen for notification you need to "add" the listener and start it. This is all done in one step. You can do this at any time, and you can have several listsners, although 1 is really all you need to have for dispatching purposes. The code in the push button on the TestNotifications window illustrates this. After that you can do what ever you want with each notification. the class "myOpenBaseNotificationListenerEvents" which implements the interface. This class is intended to mimic the Database class in REALbasic. GetProperty gets any of the available properties from the connetion. You should use Username, Host, and Password properties of the OpenBaseDBConnection class to establish the database connection. The values of IsPrimary and NotNull are set using the SQL Select statement that created the table. TableSchema returns an OpenBaseRecordSet with one field, TableName (String). The purpose of the Property method is to retrieve miscellaneous information from the data source. The only property retrievable with this call is the Version. Use the SQLSelect and SQLExecute methods to communicate with your data source via SQL commands. Use SQLSelect to call the SELECT statement and the SQLExecute statement for all other statements. Any call that returns data is accessed via the SQLSelect method. Calls to stored procedures that return results are performed using SQLSelect. A record set is a collection of information returned from a SQL Select method invocation. This can be a single value, a single row, or multiple rows from the database. The OpenBaseRecordSet is designed to be a replacement for the RecordSet found in REALBasic itself and so shares many of the same methods, events and properties and behaves as identically as possible. A database field represents one of the columns in a set of records. This provides the accessors needed to get the value from the column for use in REALbasic. Using an accessor for a value that is NOT the native darabase type will result in value conversion being performed. For instance, ifthe data type in the database is a DATE and you access the value using IntegerValue the date will be converted to OpenBase's Integer representation for the date. TableName returns the table name that this column came from. Derived and aggregates will return "derived"
Used to create new records in a table. Can I use Threads with OpenBase Database Connections ? Yes, BUT you should NOT share a connection across threads. Each thread should have its own separate connection. This is similar to the recommendation REAL Software makes regarding using threads and connections to the REAL SQL Database. The reason for this in OpenBase is that SQL queries do not block while waiting for results. The old plugins did block and so you could not issue a second query while waiting for the results of another to be returned. You had to get the results from a query before you could issue another query. the module does not know which results are for which query and that the results can become interleaved leading to very odd and hard to track down problems. If you use threads you may want to use a semaphore to control access to the Connection if you must share a connection across threads OR just use separate connections in each thread. What is the OpenBaeLinuxConsts for? Newer versions of REALbasic can handle this and track down the real library RB 5.5 cannot so you need to manually set the correct value for the library in this constant to the actual shared library name. Why do I get a KeyNotFoundException when inserting records? With the very latest version you should NOT experience this issue any longer. If you do, please report it to moc.esabnepo|troppus#moc.esabnepo|troppus with sample code and the version of the Module you are using. Why does my app reconnect to the database? Auto reconnect has been implemented in the module. This means that when the client loses connection with the server it will try to automatically reconnect. However, it is still important to check your return codes and be aware that this can happen in your application. This is especially true if you are using transactions. When transactions are involved, a disconnect will force your transaction to be rolled back on the server. As a safeguard, we also require you to do a rollback on the client before redoing your transaction. The rollback is required so you don't continue executing a the rest of your SQL outside of a transaction by mistake. If you detect a disconnect you need to always issue a rollback or your SQL will be ignored. There are two error codes you should check for to detect a disconnect. Error 102 means that the server disconnected. Error 13 means it reconnected.